We have already seen these two beautiful Huayra, now we know they both belong to the same owner who lives in Geneva where the cars are registered. The Huayra on the left is an early production car, it is the second Huayra delivered to the public, chassis n°004, left hand drive and showcased in Geneva Motor Show 2012. It features a bare carbon fiber body with black wheels, while the red brake calipers are matched with the leather of the interior. It recently got the Track Pack. 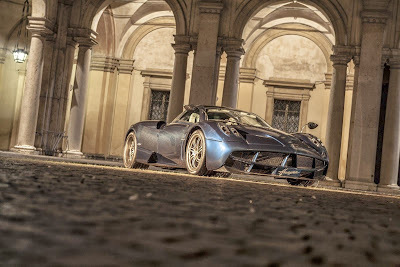 The other amazing Huayra is the same car which was exhibited at the Military Academy in Modena few months ago. This car has a similar paint to the Zonda Tricolore, a bare Carbon Fiber body with a fine layer of dark Blue paint. The cockpit is white cream with some carbon fiber finishings. The car features also track pack, black brakes calipers with matte grey wheels and Left Hand Drive. These amazing cars were both delivered by the famous Pagani dealer in Geneva, Carugati Automobiles.